If you’re one of the roughly 30 million Americans with diabetes—or one of the tens of millions more with prediabetes—you may or may not be aware of the extra danger to your feet. Diabetic wounds (also known as ulcers), which frequently form on the feet, are one of the most dangerous and common complications of the disease. 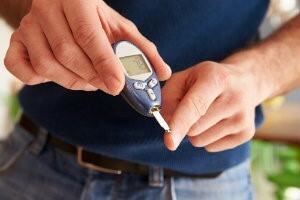 Preventing wounds, and quickly treating any that appear, must be a top concern for anyone with diabetes. It could easily be the difference between continuing to live an active life with two healthy feet, or losing part of your leg to a medically necessary amputation. People with diabetes are at an elevated risk for ulcers due to a combination of factors. Excess blood sugar frequently causes damage to nerves in the extremities, and diabetes is also associated with vascular diseases that decrease the flow of blood to the feet. This forms something of a one-two punch—you’re less likely to detect an injury due to lack of sensation, and your body is less able to heal itself or fight infection due to lack of circulation. Debridement. We thoroughly clean the wound of all foreign particles and infected or dead tissues. Medication and Dressing. The wound will be treated with any necessary medications or antibiotics and bandaged. Off-loading. It’s important not to put weight or pressure on the wound during the healing process. Depending on the location and severity of your wound, we may recommend the use of casting, walking boots, crutches, or even a wheelchair if necessary. Follow-up. We may need to have you back at our office for a few follow-up appointments, especially if an infection was initially present. These will be to check on your progress, as well as re-medicate and re-dress the ulcer as necessary. You will also have some at-home responsibilities to ensure optimum healing during the days we don’t see you. Keeping your blood sugar levels within a healthy range is of utmost importance, as well as fully following all of your doctor’s orders and recommendations—we’ll make sure you and any additional caregivers are fully educated and prepared to do this. Inspect your feet thoroughly at least once every day. Use a mirror or enlist the aid of a caregiver if necessary. All issues—cuts, bruises, redness, swelling, blisters, etc.—should be taken seriously. Contact us immediately. Practice good foot hygiene and wear clean, dry, not-too-tight socks made from moisture-wicking fabrics. Wear comfortable, cushioned, supportive shoes at all times. Don’t go barefoot, even at home. We may prescribe diabetic shoes if appropriate. Don’t smoke and avoid excessive alcohol intake. Schedule a regular diabetic foot checkup (at least one per year) with our office for maintenance care and monitoring for any potential problems.